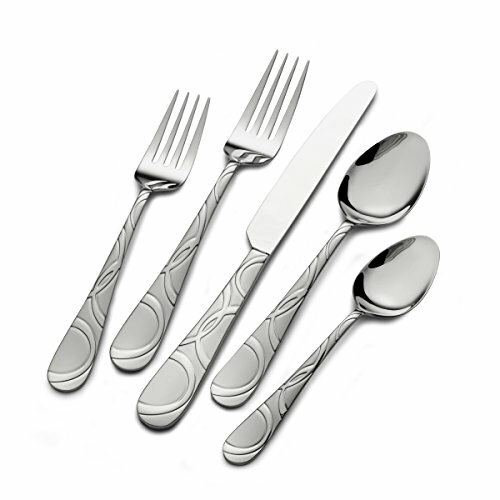 Bring a touch of elegance to the dining table with the Pfaltzgraff Everyday Garland Frost 53-Piece Flatware Set. Serve family and friends with a complete place setting for any dining event. Each handle features an attractive design that will bring a contemporary touch to any tabletop. 53-piece set includes 8 each of dinner forks, salad forks, dinner knives, dinner spoons, teaspoons, and steak knives, plus a 5-piece serving set with tablespoon, pierced tablespoon, cold meat fork, sugar spoon, and butter knife. Thanks to 18/0 stainless steel, this set stands up to the rigors of everyday use. Every piece in the set is dishwasher safe for easy and quick cleanup. This looks like a nice set but it arrived in a torn … This looks like a nice set but it arrived in a torn box. I planned to give as a gift so it does not have a good presentation. Otherwise, looks like it would work nicely.